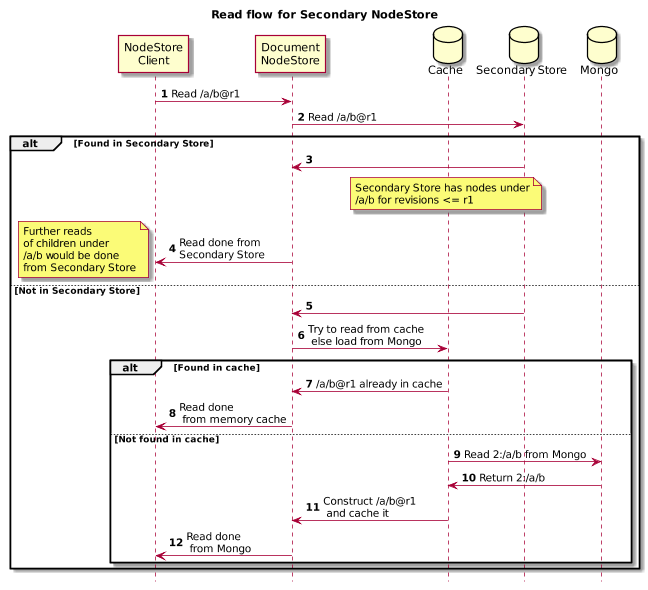 Compared to SegmentNodeStore DocumentNodeStore has higher latency for reads for the data not present in the cache. This happens due to multiple round trips required to serve a hierarchical read access over remote storage. For e.g. reading content of path /content/assets/nature/sunrise.jpg would require around 4 remote calls if the path content is not present in local cache. Persistent Cache helped in improving this by enabling caching lot more content off heap compared to limited inmemory cache. With new Secondary NodeStore support its now possible to configure a SegmentNodeStore as a secondary store to store content under certain set of paths locally. SegmentNodeStore act a local copy of remote repository (secondary store) more like a local git repo which gets updated from primary store (remote Mongo storage) via observation. Writes are still routed to primary store but reads can be served from local secondary store. In above setup 2 Oak Cluser nodes connect to same Mongo server. 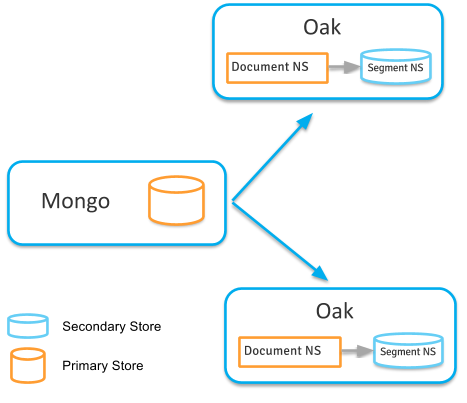 In each Oak instance a SegmentNodeStore is configured as secondary store. This store gets updated by observer. Read would be first attempted from any configured secondary NodeStore. Note that even if root revision of secondary store is lagging behind current head its possible that read for /a/b can be handled by secondary store if /a has not been modified recently. So those parts of repo which have not been recently modified would most likely be served from Secondary NodeStore and avoid remote calls to Mongo. For local changes done on that cluster nodes the writes are applied as part of Observation call where DocumentNodeStore send content change callback to all registered observers. Here Secondary NodeStore registers itself as an Observer and listed for such callback. DocumentNodeStore periodically performs background reads to pickup changes from other cluster node. Such a change is then pushed to registered observer as an external change. 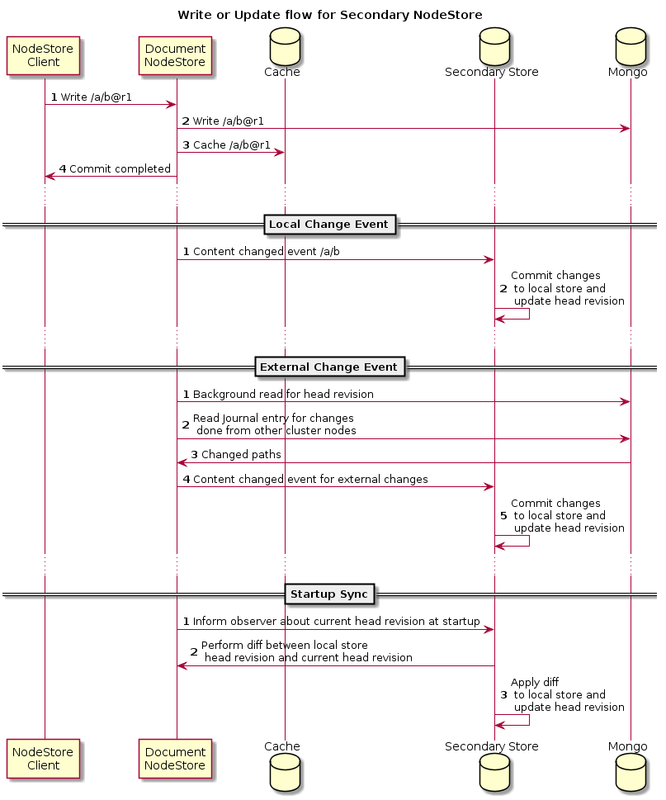 Secondary NodeStore uses same flow as for local changes to update its state. SegmentNodeStore can be copied from any existing cluster node to a new node. For best performance include those paths of the repository which are accessed by end user. Specially those content paths where read to write ratio is high. Certain maintenance like online RevisionGC for secondary NodeStore i.e. SegmentNodeStore need to be enabled. (This feature is currently pending OAK-5352).